We forget that walking can be a part of our public transit system too. Up to a quarter of local streets do not have sidewalks, an often-overlooked gap in our transit infrastructure. On one of those gorgeous weekends Toronto has been enjoying recently, a friend and I went on an urban exploration. We took transit. We met up at St. Clair West Station and headed for the Scarborough Bluffs. We took the subway to Victoria Park, and then the #12 bus along Kingston Road. From there, we could walk down Brimley Road to Bluffer’s Park. It was quite straightforward and a lovely exploration, except for the part where we took our life in our hands trying to walk down Brimley Road. It’s a steep hill down to the water and it has a few blind curves along the way. There are deep ditches on either side for stormwater to drain without flooding the road. But there are no sidewalks. If you haven’t had the pleasure, Bluffer’s Park is gorgeous. It is one of Toronto’s treasures. The scenery is stunning, the beach is lovely, and there is lots of space for recreation. We saw many large groups who had come prepared for the day with coolers and barbecues. I spoke to people who live in the neighbourhood, who enthused about how lucky they are to have such a beautiful spot just down the road. They go down to the water all the time. They live less than a kilometre away. They drive. When I mentioned we had walked, they exclaimed at how dangerous that was. The lack of sidewalks is not unique to Brimley Road in this area. Bluffer’s Park Road, which runs along the waterfront, doesn’t have any sidewalks either, although at least there is the option of taking the path through the park (which runs beside the road in places). Chine Drive, the next street west from Brimley off Kingston Road, was the site of a small skirmish over sidewalks a few years ago that went all the way to the Ministry of the Environment. A petition to “Save Chine Drive Forest” argued that the area was basically rural and that sidewalks would displace trees and wildlife. A girl was killed on one of those sidewalk-less roads in 2013, in a neighbourhood just west of Midland, between Kingston Road and Scarborough Heights Park. In response, several residents in the area petitioned for sidewalks. On Chine Drive, there had been a plan for a sidewalk since at least 2004, because Chine Drive has a local elementary school, and parents wanted a safe path for kids to walk. Dylan Reid wrote a good summary of that debate. The next year saw the same skirmish flare up on Midland Avenue. Just in case you think this only happens in Scarborough, the same debate took place in Lawrence Park last summer. Such sidewalk disputes are usually framed as local, neighbourhood issues. But our little trip to Bluffer’s Park demonstrates that the lack of sidewalks is not just a local issue, it’s a “last mile” problem for using transit in and out of the area. The “last mile” problem refers to the gap between transit riders’ residences and their transit stations. The GO Train system is a perfect example. Train stations are surrounded by vast moats of parking because riders commonly have few (or no) good options for getting to the station except to drive. More people will take transit if they have better access to it. It’s not merely a question of distance. Studies have shown commuters will walk as much as a mile, but what that route looks like can make all the difference. People don’t enjoy circuitous routes that make them feel like the journey is longer than it needs to be. And they don’t like walking alongside fast-moving traffic, or having to cross multi-lane boulevards, or any other conditions that make them feel vulnerable. A complete transit system would enable riders to go door to door without needing to get in their cars to access the system in the first place. That means solving the last mile problem with modes of public transit that connect efficiently, comfortably and reliably to bigger systems like the GO Train. Reducing the need to drive to train stations will also free up lots of valuable land around stations for a more useful purpose, and make the stations more accessible. While solutions such as shuttle buses and cycling get a lot of attention, experts say that plain old walking is “among the most useful and cost-effective first and last mile strategies.” Walking and sidewalks are part of the public transit system. 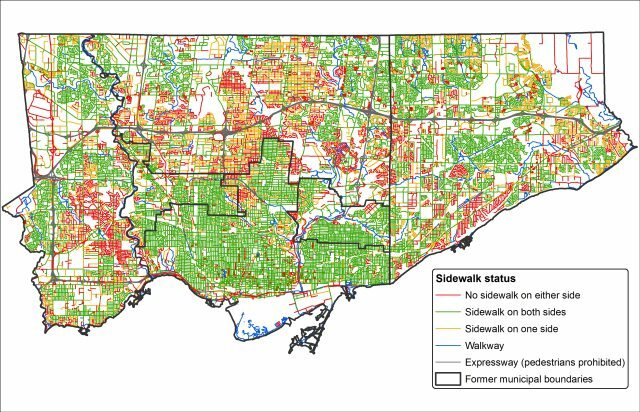 Sean Marshall noted last year that up to a quarter of local Toronto roads do not have sidewalks. Marshall’s piece includes a great map that he produced, which shows that there are no sidewalks on either side of almost all of the roads between Warden Avenue and Scarborough Village, between Kingston Road and the water—despite the fact that there are lakeside parks running almost the full length of that stretch. A map of the City’s sidewalk infrastructure circa 2011. 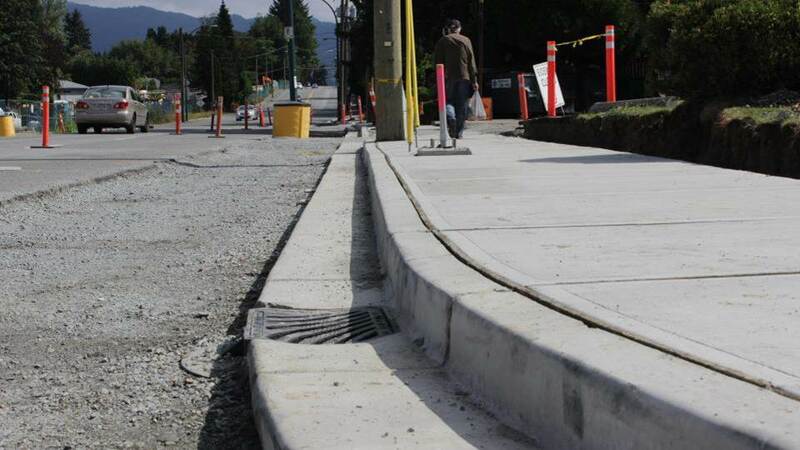 Last year, city planners recommended a new protocol to curtail the ability to protest sidewalks, so that the City could install them in the interest of safety and accessibility where it saw fit, despite any objections. Bluffer’s Park and other lakeside greenery should be open and accessible to everyone. We want the whole city to enjoy them, but we don’t want the whole city to drive there. Certainly the locals wouldn’t welcome more traffic and parking problems. Just as important, the people who live in the area ought to have better access to the transit that runs along Kingston Road. Many of them cannot walk safely to their local bus stop. Sidewalks are part of solving the last mile problem for Toronto transit. It’s not just a local issue. It’s about access to the whole city for everyone.